They are the must-have fashion accessory for the socially aware - and now Tony Blair has got in on the craze. Whether worn to highlight racism, cancer research or poverty, coloured bands are a familiar sight on the wrists of footballers and pop stars. Now the prime minister has been photographed wearing a white Make Poverty History wristband during a trip to a hospital in Edgware, north London. A Number 10 spokeswoman said Mr Blair was given the band at a recent lecture. "It's my understanding that he was given the wristband on Tuesday when he was taking part in a lecture organised by the Faithworks Movement," she said. On that occasion Mr Blair was speaking to church leaders, other faith representatives and community activists in London about his vision for the role of faith in the UK. 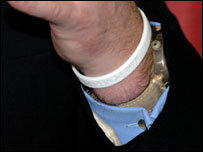 He joins comedian Graham Norton and singer Jamelia in sporting such a wristband. Nelson Mandela handed out the bands during a recent rally in London. Also backing the campaign are comedienne Dawn French, who gave the prime minister a white wristband during a meeting in Downing Street. The recent wristband fad was begun by cyclist Lance Armstrong, who wore a yellow Livestrong band to support his foundation, set up following his battle with testicular cancer. Since then celebrities such as Bono, Bruce Willis and Robin Williams have been swept along. Footballer Thierry Henry wore a black and white band as part of an anti-racism campaign and Radio 1 launched a wristband to coincide with the government's anti-bullying week. Sadly for Mr Blair, not everyone is "on message" about his latest fashion statement and what it means. One person, it emerged, mistook the wristband for a hospital identity bracelet and feared the prime minister had been back for treatment after another heart scare. Do you know your awareness bracelets?